Gray wolves are trekking farther south in California. A 2-year-old female, known as OR-54, recently wandered through Nevada County in the northern Sierra Nevada. Until now, the California Department of Fish and Wildlife had reported wolves only as far south as Lassen County. 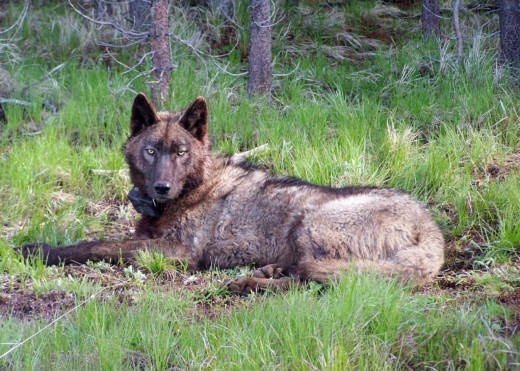 The wolf is collared with a GPS transmitter that allowed officials to determine her whereabouts just off Interstate 80, near Boreal Mountain. OR-54 is so named because she was the 54th wolf Oregon biologists have radio collared. She’s following in her father’s historic footsteps. Known as OR-7, he was the first gray wolf to cross into California from Oregon in almost 90 years. Wolves are making a comeback in the West after they were eradicated by humans during the 1920s. 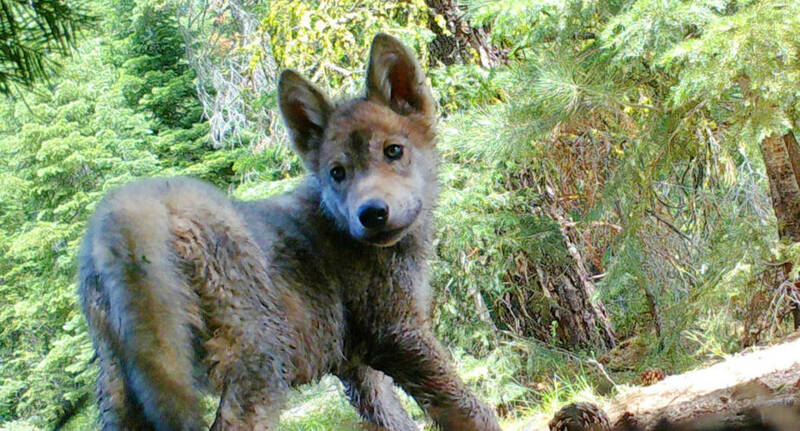 “The fact that we have wolves coming back to California is a great testament to the federal and state Endangered Species Act protections that have allowed these remarkable species to recover,” Weiss said. This is the second time OR-54 has visited California. She crossed the border in January and stayed until late February. California Department of Fish and Wildlife wolf specialist Kent Laudon said someone outside of Chester, California caught her on video during her first visit. She went home for a few months, and then returned in mid-April. It's common for wolves to leave their pack at about her age. When wolves are somewhere between 2 and 3 years old, they make their first solo wilderness outing, likely in search of a mate. Currently, biologists know of six other wolves with radio collars living in either Plumas or Lassen counties. But there could be more that have remained under the radar of biologists. Wolves are very shy animals. "If they see, smell or hear you, they're probably going to be gone before you see them," Weiss said. "Wolves are not dangerous to humans." In the last 100 years, two humans have fallen prey to wolves in all of North America, including Canada, Alaska and the lower 48 states. Weiss said it's questionable whether a wolf actually killed the second person. In contrast, she said about 20 people die annually from encounters with livestock. "You would be more likely to die from a lightning strike than from a wolf," Weiss said. She hopes more pups arrived in California this spring. Weiss speculated that the Lassen pack had a litter a few months ago. Wolves usually breed around Valentine’s Day (appropriately enough) and pups arrive around mid-April. She expects pups to emerge from their dens any day now. The state's wolf management plan estimates that Northern California, not including the Sierra Nevada, could support up to 500 wolves.